Poverty is created by the systems we built." 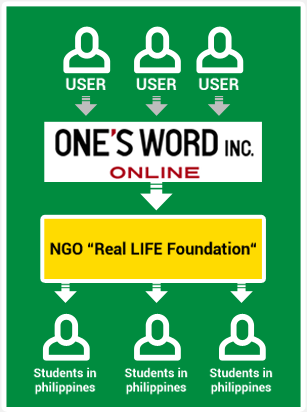 One’s Word Inc., the operating company of One’s Word Online sets the idea of ‘Social Business’ as its corporate philosophy. Mr. Yunus proposed the idea of Social Business, the system or business to seek the solution of social problems and generate enough profit. Following a motto of Social Business ‘give opportunities, not just charity’, we support economically-challenged students. We also wish to create the system that we can work with the students we support through One’s Word Online in near future. 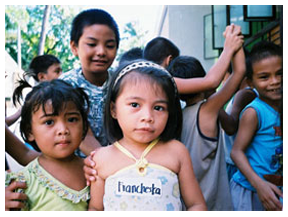 Since 2003, Dr. Castro has personally supported economically-challenged students in Philippines. As the needs continued to grow, he started Real LIFE Foundation in 2007. Their mission is to support excellent but economically-challenged students who can’t continue their education without scholarships. So far they have supported more than180 students and at least 56 students graduated from universities. The foundation is operated by 15 % of the donations and they allot 85 % of them to support the students. (living expense and textbooks are included). One’s Word proposes the users a chance to donate a certain amount every month. We add a part of our sales to the donations and send them to Real LIFE Foundation. ※Of course, the donation is not compulsory. A user can also choose the donation from 2 USD, 5 USD,7 USD, or whatever amount you wish. Brief Report of Donation to the NGO "Real LIFE Foundation"
We donated USD 200 for David to help him. One’s Word Online is a website that provides quality content designed in consultation with education professionals and world-class online teachers.